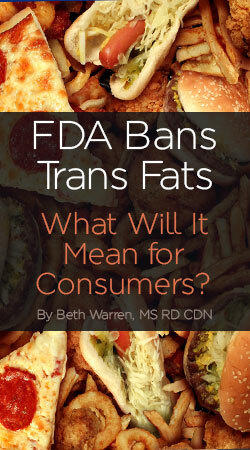 FDA Bans Trans Fats - What Will It Mean for Consumers? You are here: Home / Healthy Eating / FDA Bans Trans Fats – What Will It Mean for Consumers? 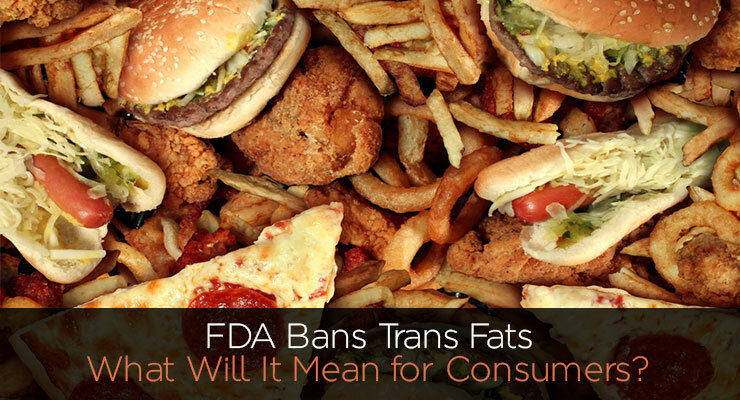 FDA Bans Trans Fats – What Will It Mean for Consumers? As Americans, we were told all fats are bad as early as the 1990’s. As a result, food manufacturers stripped fat out of packaged goods, called them “fat-free” and substituted the ingredient with many processed chemicals and sugar. Oddly enough, over the years the switch made Americans unhealthier, contributing to the rise of type 2 diabetes and obesity. Not all fats however, are created equal. Some fats help our health, while others, such as the commercially processed trans fat that the FDA recently banned from use in food products, are proven to harm us. Trans fats undergo a process of hydrogenation which transforms the liquid vegetable oil into a solid fat, increasing shelf life in packaged goods, along with flavor and texture. It has long been proven, beginning around the 1960’s, that trans fats not only do not benefit our health, but increase risk of complications including coronary artery disease and heart disease, the leading cause of death in the United States. The connection is related to the science showing trans fat increases, LDL, the bad cholesterol, and lowers HDL, the good cholesterols. It also changes the entire lipid profile and increases an even worse form of fat called apolipoprotein B. Trans fats have also been linked to cancer, mood disorders and type 2 diabetes. Commercially processes trans fats are found in many packaged foods resting on the market shelves. From cookies to cakes, to peanut butter, popcorns to crackers, trans fats are lurking even when it says there are “0 grams” of trans fat in the product. The confusion is a result of the FDA policy in January 2006 that enforced the mandatory listing of trans fat on food labels, but only over .5 grams in the product. As a result, if the words “partially hydrogenated” are listed in the ingredient list, it means trans fat is in the product, but not enough to list on the food label since less than .5 grams is consumed per serving they recommend. The reality is that Americans over-consume recommended portion sizes, for example, more than the recommended 1/2 cup serving of ice cream, and if partially hydrogenated oils are listed as an ingredient, they just consumed a higher amount of trans fat. Since the policy of the food label did not help the trans fat levels in food nor its affect on our health, the recent ban on using any trans fat in products has passed. Food manufacturers have three years to completely eliminate them from the ingredients, most likely due to the time it will take them to reformulate their ingredients, change their packaging, and other modifications. Hopefully, the replacement ingredient will be more healthful, but keep in mind, trans fat use in products typically meant the product as a whole was heavily processed and should be consumed moderately, not that taking trans fats out have us permission to over consume cookies and cakes, or we would have a similar public health concern of the 1990’s. 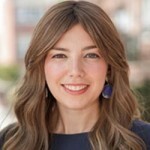 Beth Warren, MS RD CDN, is the author of Living a Real Life with Real Food (Skyhorse; 2014), and head of Beth Warren Nutrition, a private practice in Brooklyn, NY and a proponent of healthy living by eating kosher. Along with conducting nutrition counseling in her private practice for both pediatric and adult clients, Beth is the nutritionist at the Morris I. Franco Community Cancer Center and the head sports nutritionist for the Sephardic Bikur Holim, a not-for-profit organization. She also works as a consultant for schools and businesses to help organize nutritious and delicious meals and snacks, perform workshops, health fairs and lectures for clients including The Macular Degeneration Association and the Sephardic Community Center. www.BethWarrenNutrition.com.